The details may be uncertain, but all signs indicate that the new provisions will provide consumers the information to make nutritious choices and RDs the reimbursement to offer preventive services. When President Obama signed the Patient Protection and Affordable Care Act into law on March 23 (with the House of Representatives passing a reconciliation bill shortly thereafter), healthcare reform became a reality for all Americans—citizens, insurers, and providers alike. Now that all of the debating is done, sacrifices made, compromises reached, the hard work can begin. Detailing all of the new law’s provisions that may apply to dietitians is beyond the scope of this article, but Today’s Dietitian has interviewed some in-the-know experts to elaborate on that which may be of most interest to those in the field. Delve into the details of what some see as the dawning of a new age in healthcare, one in which prevention—and the prevention professionals themselves (you! )—may start to attract some much-deserved attention. One provision in the new law that may well bring smiles to RDs’ faces and that will likely be evident to any American who eats out is calorie labeling for restaurants. “There is a requirement in the new law that will have chain restaurants with 20 or more outlets list calories on menus and menu boards, including drive-thrus, food display tags, salad bars, buffets, fountain drinks—any food that’s on display or where people serve themselves,” explains Margo Wootan, DSc, director of nutrition policy for the Center for Science in the Public Interest, who helped write the provision. The labeling requirement also applies to most vending machines, and along with the calorie postings will be a to-be-determined statement regarding the suggested daily caloric intake, giving consumers a bit of nutritional context. The actual details of this will be decided in the rulemaking process. The FDA is charged with issuing more specific proposed regulations within one year, so expect to start seeing restaurants’ revised menus once the details are finalized. And because this requirement is a national standard, Weber says states and localities can’t attempt to implement something different. Part of the goal is “consistency across the country, regardless of where the consumer is looking at a menu,” she says. Weber expects states and municipalities that are already in various phases of their own calorie-labeling efforts, with laws passed at the local or state level, may halt further implementations until details about the national guidelines come forth. 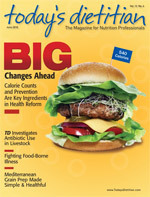 What effects should dietitians expect from this national influx of calorie information? That’s a big unknown, as the few studies conducted so far have yielded conflicting results regarding consumers’ awareness of the information vs. how it affects their food choices. For example, one study published in Health Affairs in October 2009 of low-income, minority communities in New York and New Jersey showed that while slightly less than one third of consumers said the information influenced their decisions, it did not change their food purchases, even after calorie and nutrition information were available. Weber believes the mixed bag of early data does show some promising findings—from consumers’ choices to the restaurants themselves. “There’s some preliminary data out that has shown consumers are aware of the information and some saying that they use it. Of those who say they see it and they use it, it does seem to have an impact on selection, at least for that meal,” she says. “There’s also been some data to show that companies are lowering the calorie content of some of their food items,” Weber adds. With the nutritional analysis required for calorie labeling, some companies may be realizing for the first time that their menu offerings are off kilter with the average American’s recommended daily intake. In response, some are creating lower-calorie options or reducing portion sizes to get their calorie counts in check. Weber believes there’s plenty of room for dietitians’ expertise in this new requirement, especially in the areas of nutritional analysis, validating the information, and ascertaining its accuracy, as well as working with restaurants to create healthful menu items that are also appealing to consumers. “We have some dietitians already working in those areas, but I think there’s definitely room for growth,” she says. Demonstration projects for childhood obesity and home-based care, new coverage of nutrition counseling in various healthcare settings, and funding earmarked for community-based prevention outreach efforts, to name a few. RDs should applaud Congress’ focus on preventing, not treating, disease in this law, as some provisions have the potential to dramatically change how dietitians practice—for the better. She notes that while the initial recognition of MNT services for these conditions was a huge accomplishment, patients and practitioners were limited to insufficient time for education and poor reimbursement levels. “If other insurance companies did cover MNT services, their reimbursement rates were frequently based off of what Medicare was willing to pay and often only covered the same conditions that Medicare covered,” she adds. Stay tuned for more details because the rulemaking process will determine the specifics, such as who will provide these preventive services, what providers will be paid, and the standards of eligibility. “RDs and DTRs should campaign for recognition as providers for these programs. With so many changes occurring, it is important to remain informed and involved,” Hill says. The law also eliminates deductibles and copayments for preventive services for Medicare and Medicaid, with services recommended by the U.S. Preventive Services Task Force to be covered by Medicaid. Jennifer Teters of the ADA’s Policy, Initiatives, and Advocacy Office says the U.S. Preventive Services Task Force has already given intensive nutrition behavioral counseling for hyperlipidemia, cardiovascular disease, and “other diet-related chronic diseases” a positive B rating, meaning these are expected to soon be covered by Medicaid. Yet concrete details regarding how these provisions will play out are very much speculative due to how the CMS decides to make determinations. Think: What are “other diet-related chronic diseases”? But there’s little doubt practicing RDs could soon find it easier to get reimbursed for their services. “The law itself clearly states that they believe diabetes, high blood pressure, etc … need to be addressed and covered. And there’s a lot of different places that they talk about treating obesity, so how CMS will determine what they will cover and what the science shows is most effective—that’s where we’re still working in the unknown,” explains Teters. • a child obesity demonstration project with $25 million in funds to reduce childhood obesity through educational and other activities. Dietitians looking to get involved with any of these programs may want to look to local public health or community organizations for more information, as communities themselves will likely be applying for the funding. Language in the healthcare law also creates a Prevention and Public Health Investment fund, with $15 billion in funding over 10 years, filtered through Health and Human Services. While the specifics of where these funds will go are still up in the air, communities and/or states will likely apply for these monies as well. The funding could support any number of initiatives. • reducing soft drink consumption or sodium intake. Also in the law, RDs are listed as possible providers for a home-health demonstration project as well as community-based medical home teams, workforce programs, and for Medicare annual wellness screening and counseling. Teters says the law focuses a lot on care coordination. Take the patient-centered medical home in which a physician or another provider is in charge of a patient’s overall health, with one provider making appropriate referrals to other providers, such as dietitians, and managing follow-up and medication adherence with patients. “I believe dietitians being included in this provision is a big step forward,” she says. Many RDs are excited about a provision in the new law that supports breast-feeding for working mothers. Specifically, it requires employers with 50-plus employees “to provide reasonable break time for an employee to express breast milk for her nursing child for one year after the child’s birth each time such employee has need to express milk.” While it doesn’t require employers to compensate employees for this break time, employers must provide space, other than a bathroom, that is shielded from view so mothers can express breast milk discreetly while at work. And this requirement doesn’t obstruct state laws that include greater protection. “All in all, these amendments are a step in the right direction to support breast-feeding mothers,” says April Rudat, MS Ed, RD, LDN, who is in private practice and author of Oh Yes You Can Breastfeed Twins! Yet Rudat notes that the provision isn’t without its faults: “The downfalls of the law verbiage are that employers are not required to pay women for the time they spend pumping breast milk. Therefore, if pumping sessions are initially frequent, this could impact hourly salary. In addition, those employers with less than 50 employees are not required to follow these requirements, so a woman working at a gas station with five fellow employees is not entitled to such protection. This is problematic since it is this population, inclusive of women of lower socioeconomic statuses, that needs greater breast-feeding support to increase breast-feeding initiation and duration. “Personally, I would have liked to see this amendment apply to all workplaces. Moms in corporate America can experience this advantage; however, the breast-feeding mother working at a small business for minimum wage may have to quit expressing milk because her employer does not have to grant her a sanitary pumping room or the right to do so,” continues Rudat, noting that the provision could be seen as counterproductive, since it is this population that Health and Human Services intends to support most in increasing breast-feeding initiation and duration rates. However, Teters points out that the law’s language requires employers with less than 50 employees who do not want to provide this time to prove undue hardship in order to be exempt. “So if it’s an under-50 staff, they would have to prove that it would cause significant difficulty, prove a high expense that they can’t afford, and they would actually have to show all of their financial resources, the nature, and the structure of their business. [This is] an exemption that they’d have to apply for,” she explains. Teters hopes that as education about these newly available services is disseminated (to healthcare providers as well), over time consumers will start to ask for nutrition professionals by name. “Dietitians need to keep themselves educated on any new changes in coverage of nutrition counseling and services and then start educating the physicians in their area, letting them know that they’re available to work with them. It’ll need to be a coordinated effort,” she says. “Personally, I know if I go to my doctor and need something, I know to say ‘I want a referral to this type of provider,’ and they’ll give me one. But I often have to ask. And I think a lot of people don’t ask because they don’t know, so that’s why the education is really key. Hopefully if the primary care provider is aware of these referrals, that will negate a lot of the public education,” she adds. Sharon Meier Lutheran, MSH, RN, RD, LD/N, CLC, of U.S. Preventive Medicine, puts some of the responsibility of educating the public on RDs themselves. “Americans need education more than ever before, not only on health-related topics but on healthcare reform. Dietitians need to work together and be a visible presence in their communities on obesity task forces, school boards, management teams of health departments and hospitals, etc to promote health and nutrition and make sure that the correct information on healthcare reform is known,” she says. And that’s advice requiring no reform.